I think the handles of the Artistic Text box could be improved. Dragging the middle handles changes the overall shape of the bounding box thus distorting the letter shapes. As distorting meticuously designed letters is not the thing you usually want as a typographer I suggest a different behavior of the middle handles. Dragging the ones on the left and right should change the letter spacing, dragging the ones on top and at the bottom should change line spacing. If you actually want to distort the letter shapes you can still group the container and have fun. You might argue this different handle behaviour hurts UI consistency. Alright. Then why not use alt-drag? This way it could even be used with the Frame Text box (which would be great, too). 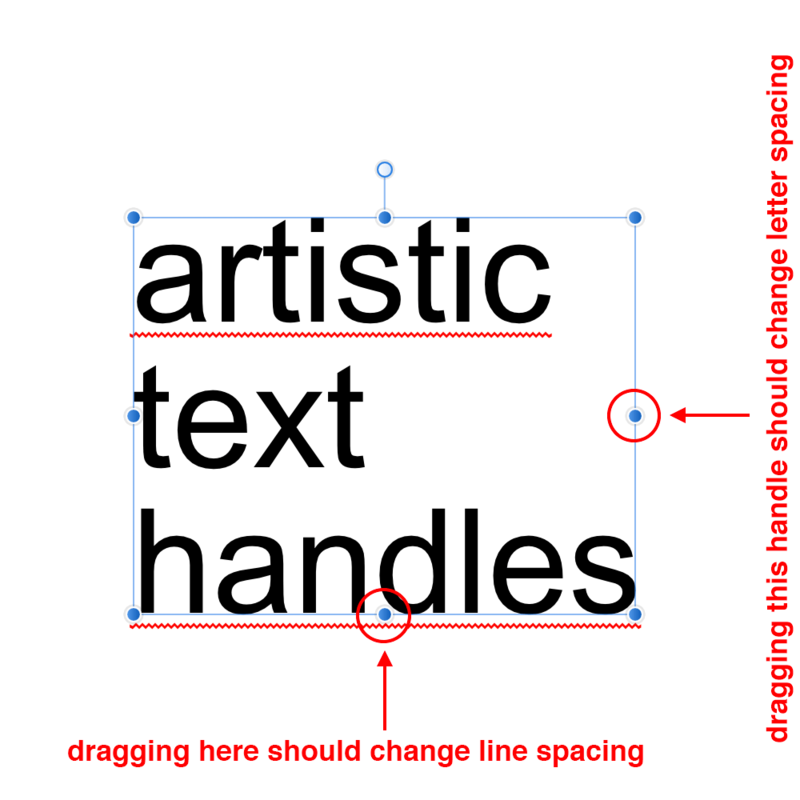 Actually, as I am writing this I think both types of text boxes should be able to modify letter and line spacing on the fly and alt-drag would be an easily comprehensible method to implement it. Maybe this post came a bit too early. But I think this suggestion is really low hanging fruit. That’s why I’m bumping it. Bump! Not sure if you are aware but you can quickly change both the line spacing and letter spacing of an artistic text frame object pressing and holding ⌥ (option/alt) and using the up/down (line spacing) and left/right (letter spacing) cursor keys (with the Move Tool selected). Hi MEB, thanks for this information, I wasn’t aware of this. Immediately checked in Publisher and in Designer. Line spacing works like you wrote. However, I don’t get letter spacing to work with the shortcuts you mentioned (although they are listed in my text menu). By the way: option/alt + left cursor collides with the system wide show dashboard shortcut in macOS. But even if I can get letter spacing by shortcut to work eventually: It would be still a good thing to have the additional option of changing text objects sensibly on the fly and with the mouse (or with the finger on iPad). At least it would suit my work style when I build a new design: I like to play directly with the objects I just put there, it is more playfull and it’s efficient too.